I have shared with you all how much I love getting my hands on any book on marriage that I can. I always want to be growing in my marriage. I want to intentionally cultivate a happy marriage! I can do this by reading books that encourage me to grow as a wife. Today I want to introduce you to a book that I have read 3 times over in a short time. I can’t get enough of the wisdom in this book. Every time I read through it I underline something new that I missed before. Like I mentioned before, I have adopted the prayer walk in my life after reading this book. Women Living Well by Courtney Joseph is a must have for every wife, mother and homemaker. Women Living Well is broken into 4 parts: your walk with God, your marriage, your parenting and your homemaking. These four areas are the main areas that a woman faces every day. These are the areas in our lives that we need to purposefully tend to. These are the four areas in our lives that matter the most. At then end of our lives our paychecks, cars or other earthly possessions won’t matter for eternity. Yet the lives we impact day in and day our will matter for eternity. How we managed these four areas matters the most yet it is too easy to lose our joy. In the midst of the mundane tasks of laundry, ironing, bathing and feeding we lose sight of the eternal worth of our jobs. Courtney gives you the practical wisdom in how to find that joy again and keep it! I love this book because despite how perfect Courtney’s life may look from her blog, Facebook or even on her Rachel Ray appearance, she tells you how she has struggled at cleaning, cooking and child rearing. She truthfully tells you that she has struggled in her marriage, that she has let her emotions get the best of her. She does her best to convey to her readers that she does not have it all together, that she still struggles with the same pull of social media versus Bible reading as we do. I love when authors are real with their readers. Who say, “Hey, I’m just like you, I struggle too, these strategies help me and might help you.” I respect that and I think you will too after reading Women Living Well . Courtney starts the book out with our most important relationship. If we aren’t walking with God we can not live a life pouring out to others. Throughout the book but especially in part one we are reminded how social media is affecting our lives. We are pulled into our phones and tablets and let our Bibles collect dust on the bookshelf. We go to our friends for advice, we scroll through Pinterest for inspiration, we check our email first thing yet we neglect our walk with the Lord. We have to intentionally pull ourselves away from this trap and create the time to spend in the Word. We need to make it a priority or it will never happen. For some of us that may mean waking up earlier, for others it may be getting some accountability, for others it may mean soaking in a verse here and there in between diaper changes and runny noses. But we will become harsh, frustrated, irritable and cranky wives when we are not filling up on living well. When we begin to quiet the noise of the world, we can then hear the voice of God. And it is His voice that allows to pour out and serve our husband and children. If you are struggling to juggle all the balls that you have to carry, then I encourage to make your walk with God a priority and let His strength equip you. Women Living Well has so many wonderful ideas to help you make this happen and why it is so vital for us. The next important relationship that we have in life is the relationship with our husband. We need to make sure that we are putting our husband before our children and serving in various ministries. Does this describe your marriage? If it doesn’t I encourage you to make changes today to put your husband’s needs first and be the wife and helpmeet that he needs. What I love about this section of the book is the gentle kick in the pants Courtney gives. She is gentle but firm in how we wives need to be treating our husband. Our husband was not created to be our helpmeet but we were created to be his helpmeet. That doesn’t mean that he can’t help you out around the house if he wants to but we should demand it or become cross with him when he doesn’t. We need to be constantly checking out our attitudes. Courtney gives you practical advice on letting your man lead, on creating greener grass on your side of the fence, and banishing bitterness in your marriage. She doesn’t just say you need to do this or change that but she gives you bulleted advice to change your old habits. One great aspect of this section of the book is the 10-day marriage challenge. She walks you through how to complete your husband and reignite the passion you once had. There is a passage to read, a verse, a challenge and then a place to write out your personal way to apply it. I love that she is giving us the tools we need to find the joy in our lives! I highly recommend grabbing this book to complete this challenge! Your husband will love it! Ladies, we have a power influence over the little in our homes. We may feel like our job goes unnoticed and not praiseworthy. But that is not the case. We are raising the next generation! We are raising the next soldiers of God’s kingdom. Are we preparing them well? Or are we letting the media raise our children? Infiltrating their minds with who knows what? We can not be absent in our parenting, we can not be distracted by our phones to not notice what our children need from us. Influencing our children needs to be one of our greatest jobs. Their little eyes are always watching us, aren’t they? It is hard to use the bathroom in peace. I am at the stage where my children stick their little fingers under the bathroom door, along with their little papers and toys. They stand out there giggling. Why do they find this so interesting? While we may find it frustrating to never get a second alone we must not that frustration steal our joy in mothering. We have a big job. We need to teach our children to walk with the King! I love this encouragement from Courtney! It is easy to lose sight of that when we are in the middle of the hard years. Courtney gives you tips on how to train your children and not just teach them or discipline them, how to deal with bad attitudes, and most important how to deal with your own anger. There is something about motherhood that brings out the ugliness in our hearts. She shares personal stories that I am sure most of us can relate to! Our anger will undermine all our hard work so it is vital that we deal with it. Women Living Well gives you the hope you need to get through the hard days of parenting. Our greatest job in our parenting is pointing our children to Jesus. They are going to learn more from us by watching than by what we say. This is why it is so important to go back to part one, your walk with God if you are struggling. Okay, let me be honest. I get giddy when I can learn how to create a peaceful and joyful home from others who have gone before me. I’m at the beginning of my journey with my oldest only being 5 and just coming up on my 7th anniversary. I love taking in all the wisdom passed down. The final part of this book is filled with so many great tips, tricks, and advice. 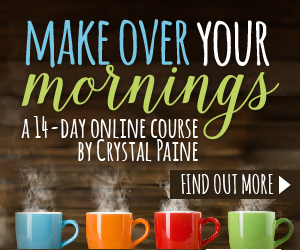 You’ll learn how to change the atmosphere in your home, control clutter, how to embrace the ever changing seasons in our lives and balance all the various tasks we have as homemakers. Since Courtney’s children are older she shares the ways in which involved them in household tasks when they were toddlers in order to get everything done yet still pouring into them and connecting with them. This method also trains them to do jobs that one day they will be able to take over. It will take more time up front but it so worth it in the long run! I have seen the fruit of my efforts of this method with my Big Guy. In this section, we also see the importance of taking time for ourselves. It is okay to take the time to fill up our souls. We talked about that when we did our make over your mornings course. The housework will never be completely finished. There will always be more laundry to do and dishes to wash and floors to vacuum so don’t bother waiting until it is all done. Take regular time outs to replenish yourself. What is the point of our job as wives and mothers? To bring glory to the Father. To honor Him in all that we do. So that needs to be our motivation. Seeking God wholeheartedly and pursuing holiness in our everyday life. My passion and what I hope to encourage you all to do as well. The book ends with great self-evaluation questions. An important thing that I think we should all be doing regularly. There are always areas in which we need to be growing or changing. As you can see from how long this post is I am passion about this book! Having this great resource at your disposal will help you do just that in all these different areas of your life. If you haven’t read it yet, I think you will find it to be an inspiring book. Everyone woman should have this one her bookshelf. Your turn! What area of your life do you need to do a self-evaluation in? Have you read Women Living Well? Did it transform your life and how you view your jobs as a woman? I know it did for me! I can always grow in any one of these areas but lately, my parenting is on my heart as my children are growing faster than I’d like. Let’s talk in the comments below! I enjoy Courtney Joseph and I spend time reading her blog. Thanks for the book review. I am yet to get my hands on it though. Ifeoma, you’ve gotta get it a copy! Mine is all marked up, it is so worth it!